This is the second (updated) prospectus produced by the Diocese of Mpwapwa, thanks to the editorial work of the Building and Plant Department. I would like to highlight two ideals that the Diocese is resolved to strive for. First, we wish to build a Church that is self-propagating, self-governing and self-supporting. In order to achieve this objective Discipleship formation becomes a topmost priority, and therefore we see the need to provide facilities where discipleship training would be conducted more effectively. Second, we seek to promote the principles of Partnership-in-Mission as elaborated by the Anglican Communion, which are best exemplified by the gospel quotation above. These principles include the twin aspects of responsibility for mission. On the one hand, responsibility for mission in any single area belongs primarily to the Church in that place. On the other hand, the nature of God’s mission in God’s world calls for mutual responsibility and interde­pendence in the body of Christ for the purpose of fulfilling the great commission. It is on this basis that, through this prospectus, the Diocese wishes to share some of its opportunities and challenges. I prayerfully commend this prospectus to our friends, with the hope that it will help them pray for us in a more informed way and discern how God may be calling them to participate in the mission of God in Mpwapwa. The region in which the Diocese of Mpwapwa (DMP) is to be found is rich in history and has been much favored in past times. Imagine an area of abundant contrasts with much of the area being upland plains interspersed with mountains rising upwards of 7000ft. The Northern parts of the Diocese form the bread pan of Tanzania, whilst other areas particularly in the South West are dry & arid. The Diocese is about the size of Wales in the United Kingdom or Lake Ontario in the States, but is much harder to traverse on account of the poor roads & mountain passes. The Diocese takes the administrative boundaries of the Mpwapwa and Kongwa Districts, which were created before the First World War by the German Colonial Authorities. It is almost centrally located on the Tanzanian mainland, lying between the 5º 30' and 7º latitudes and straddling the 36º longitude line. Its dominant physical features include plains formed at around 3000ft - 4000ft above sea level, and mountain ranges with peaks upwards of 6000ft in places such as Wotta in the South and Kiboriani immediately behind Mpwapwa Town in the center. Climatically Mpwapwa is relatively cool at night, warm, and sunny during the day. The cooler months are May, June, July and August. The average temperature is 70ºF (21ºC) with an average of 27½” rainfall (700mm) per annum. In good years the rainy season starts from mid November until the end of April, but about one in every five years it is prone to fail completely. Two main routes of the country cut across the Diocese, namely: - the East-West trunk road about 31 miles (50km) to the north of Mpwapwa Town, and the Central Railway line about 12½ miles (20km) to the south. The fact that the town is away from both main routes has contributed to its slow and almost stunted growth over the years, in spite of its rich hinterland. The national census of 1988 recorded a population of 339, 954 people, of whom 164, 903 were men and the remainder women. The growth rate is 2.4% per annum, so it is not surprising that of these more than half of the present estimated population of 462, 750 is under the age of 15. The people, who are mostly Wagogo together with Wahehe in the higher parts of the South West of the Diocese and Wakaguru to the East, are in the majority (95%) subsistence farmers, and very much dependent upon good rains. No rain = no food. They are among some of the poorest tribes of Tanzania, which itself is classified by the UN as the second poorest country in the world. They are largely scattered in rural villages. Major crops are maize, millet, sorghum, groundnuts and sunflower. In addition a few farmers keep cattle, donkeys, goats and poultry. It is estimated that about 26% of all the population belong to the Anglican Church, so that today there are about 123, 000 Anglicans, served by 78 Clergy and 452 Evangelists in 63 Parishes. The sheer numbers bring ever increasing pressure to bear upon the Church leaders who themselves have, by and large, only had the most basic of education, be it at school or through the Church. Only 20% of the pastors in the Diocese have a Diploma or Degree in theology, and this leaves a young Church in danger of finding ways not akin to the teaching of Christ. The good news of Jesus Christ arrived in Mpwapwa with the arrival, in 1876, of Mr. George John Clark and Mr. William M. Robertson who were sent by the Church Missionary Society (CMS), England, to establish a service base for the long trek from the east coast to Uganda, the ultimate destination of CMS pioneer missionaries. Mr. Cameron and Henry Morton Stanley (whose 1871 engraving on a stone can still be seen close to the Cathedral) had recommended Mpwapwa to CMS as a suitable base. These two early travelers reported how they had been "well received by hospitable local people and very intelligent Chief' (Lukole, whose grave lies not far from the Cathedral). Mpwapwa was recognized as a CMS Mission Station in its own right in 1878, when Dr Richard Baxter, Rev H. Cole, and John Price were sent to establish it as the base for mission work in mainland Tanganyika. Price’s love for the people and ability to master the Chigogo language gained him the epitaph of Bwana Mwalimu (Master Teacher). His grave is situated within the Cathedral grounds at Ving’hawe. The local people were keen to respond to the Gospel, though the first baptisms took place on Christmas Day 1885 with confirmations some five years later. From 1876 until 1926, Mpwapwa was the center for most of the planning and execution of missionary work to mainland Tanzania; an area now covered by twelve of the nineteen Dioceses of the Anglican Church of Tanzania. Mpwapwa, because of its favorable climate, was also the provincial headquarters of the German administration in the early years. During this period a number of important centers and institutions were opened in the Mpwapwa and Kongwa area, serving the missionary enterprise elsewhere in the country. These included a Church and a mission complex, a printing press, a maternity clinic, a retreat center, and Huron College - a training school for Catechists (later to become St. Philip’s Theological College). When in the early part of the twentieth century the German Government moved the provincial headquarters from Mpwapwa to Dodoma, the Mission Headquarters followed and indeed Dodoma has become the capital of Tanzania. This move, and the subsequent growth of the Church far and wide, had considerable adverse effects on the pioneer mission centers. Naturally they suffered from competing priorities and were left in disrepair. The (mostly unpaid) Catechists working at village level however continued the work and through their devoted efforts in evangelism and pastoral care the growth of the Church was sustained at its grassroots, which brought the need to revitalize the pioneer centers, and consequently to establish a new Diocese. At the time of the inauguration of the Diocese of Mpwapwa on 23rd June 1991, the rebuilding of key pioneer stations had already started with the view to providing the much-needed support to the fast growing Church in the Mpwapwa and Kongwa Zone. Since this new Diocese is built upon the bedrock of the work of the early missionaries - local and expatriate, it accepted from its beginning, the challenge to keep alive the history of the Church with some of its cherished institutional milestones for continued inspiration. The Spiritual centers of Ving’hawe, Chamuhawi, Kiboriani and Kongwa speak both of the history of our faith in this part of Africa, as well as witnessing to the empowerment of the Holy Spirit in the lives of priests and people, teachers and students, young and old, in the evolving life of the Diocese. These centers pay homage to the pioneering work of people like John Clark, the Revs. H. Cole, John Price, TBR Westgate, Andrea Mwaka, Harun Mbega, and Daud Mhando. The Diocese is encouraged by their example and inspired, as they were, to establish centers that facilitate the implementation of the Great Commission of Jesus Christ who is the same yesterday, today and forever. St. Luke’s Church Ving’hawe had been started under the leadership of the late Rev. 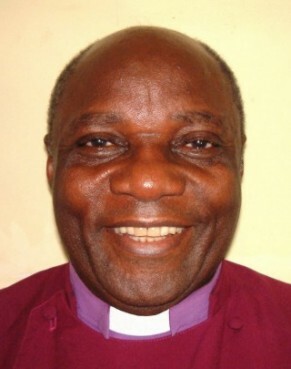 Canon Petro Kutoka (the first Vicar General of the Diocese). This new Parish Church of concrete blocks was half built on the historic site where the old mission complex had once stood. With the creation of the Diocese, it was decided to adopt and adapt it for the Cathedral. After several attempts at adaptations, it became obvious that the Church built for the life of an ordinary Parish was not going to meet the needs of a Cathedral and so the walls were pulled down in June 1992 and work undertaken to construct the present stone walls encasing a reinforced concrete frame. 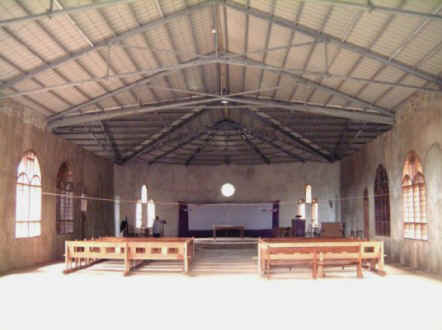 The design was developed in conjunction with Messrs. Ambicon Construction Co of Dar-es-Salaam and the American Architect and dear friend of the Diocese, Don Neraas, who was particularly asked to pay attention to the roof and window design incorporating the circular symbol of the Mpwapwan Rolling Hills together with that of Christ, a Cross raised to head the Church. Work on the walls was completed in June 1993, and the roof trusses were being erected when they collapsed due to strong winds, just before they were properly bolted. All the same +George Carey, the Archbishop of Canterbury, consecrated the unroofed Cathedral to All Saints on 9th June 1993. Every cloud has a silver lining! The collapse of the trusses led the Cathedral Chapter to revisit an earlier option which had been dropped due to costs: That of using steel trusses and a canopy of either metal sheeting pressed to give the appearance of tiles, or of clay tiles. Later that year, the first full time missionary couple, Mr. Godfrey and Dr. Rachel Tarling arrived. Godfrey, a qualified corporate building engineer, came to assist the Diocese with the various building projects needed to develop its infrastructure. He was asked by the Cathedral Chapter to study the various options, in consultation with our Architect friends mentioned above, and to give technical advice. After undertaking calculations, it was strongly felt that with the width of the Cathedral and the expected life span of a timber roof, it would be more beneficial to erect steel trusses and metal sheeting rather than clay tiles. Dr E. J. Baxter was the pioneer medical doctor in central Tanzania. As well as running an itinerant health program throughout the area served by CMS Tanganyika, he set up a Maternity Clinic in Mpwapwa as early as 1878. This continued to operate up to the 1950's and was only closed due to the over-stretched resources of the then huge Diocese of Central Tanganyika. Dr. Rachel Tarling, who in 1993 was asked by the Diocese to reopen this medical service in the Old Bishop's Rest House within the Cathedral Multi-purpose Complex, quickly built up a strong practice, which had all but grown out of the temporary accommodation. Again in conjunction with Don Neraas plans were drawn up to further develop the foundations of the new Clinic laid by Mrs. Eileen Carey, wife of the Archbishop of Canterbury. The new Clinic opened its doors in January 1997 and now sees approaching 5,000 patients a year, but as a GP type surgery to complement and work alongside the Government District Hospital. Many would love to see a maternity wing added once more. Keenly aware that in addition to formal worship, practical needs, and fellowship, the pioneer missionaries ensured that there should also be times set aside for rest and recuperation - essential for reflection, meditation and refreshment for the daily burdens of valley life. Thus, they chose the site of Kiboriani (set as it is within a short five minute walk of the mountain peak with views overlooking virtually the whole of the Diocese) in 1902 as an excellent Retreat Center - the "Sanatorium' (pictured on the front cover of this Prospectus) as it is officially referred to in all missionary records of the pioneer period. With its historic remains, the original mission house would prove to be inspirational. Plans have, therefore, been drawn up to initially develop it as a fifty bed Retreat Center using local materials and appropriate technology methods such as lime mortar construction drawn from the traditional technique in which English country houses have been successfully built. Most of the strategizing on missionary expansion and key decisions that led to the formation of the Diocese of Central Tanganyika in 1927 were made at Kiboriani. Up to the late 1960's the Kiboriani Sanatorium hosted a number of conferences, retreats, holidaymakers and Christian Student Camps. Sadly, since then the roof has been plundered, and most of the wall structure fallen into disrepair. What remains is strong and a great challenge to restore the site to meet the growing needs of today’s Church, its leaders and youth groups. All those who have witnessed God's abundant beauty bestowed on the Kiboriani Peak, some 6000ft above sea level, long and pray for the reconstruction of the now renamed Kiboriani Retreat and Youth Center. An essential part of the rehabilitation program is the provision of adequate water for both the Retreat Center and the community around it. a.) To spread the Kingdom of God in the Diocese through Evangelism and Christian Nurture, building on the strong foundation of the pioneer missionaries - Local and Expatriate. b.) To build up and equip the Body of Christ for Service (Discipleship). c.) To promote holistic development of the population through education and other socio-economic activities. d.) To promote partnership and cooperative action in mission with other Churches and organizations dealing with the Spiritual and Physical development of the human being, both within the Diocese and beyond. a) To continue with the emphasis of understanding good stewardship of material possessions as the result of inner spiritual integrity and maturity. b) To form in each Parish and Deanery a Team of Facilitators responsible for stimulating the steadfast growth and maturity of its people in order that they may receive humbly, use wisely and give generously, the spiritual and material resources God has entrusted to them. c) To raise the level of giving to the Diocesan Central Fund raised locally from the current 34% to 60%, with 90% of Parishes reached for training and advice on better Bookkeeping. a) To build upon the already strong grassroots witness, taking this on to provide much needed follow up Biblical study and prayer in each congregation; for each Christian to be both a learner and a teacher. b) To continue challenging the remaining Parishes to accomplish, through self-reliance, the construction of permanent Parish Churches and Pastorates, replacing old and often-dark mud buildings. c) To extend to each congregation the knowledge and best practices of forming and running Small Groups, and facilitate the formation of more Small Groups from the present 440 to 1,000.
a) To increase the number of properly trained clergy through Theological Education by Extension (TEE), regular in-service courses / seminars, and at Theological Colleges to reach the target of 90% with at least the Provincial Certificate in Theology. b) To revitalize literacy classes and continuing education in every Parish, so as to enable lay people, especially women, to manage their own development and to play their part in leading the Diocese and witnessing in their communities. c) To improve and to add more facilities (Teaching Block and Assembly Hall) at the Chamuhawi Christian Training Center in order to meet the growing need of trained Evangelists, women and youth leaders, and to provide Seminar facilities. a) To provide in each Parish, training that will empower communities and individuals to improve their commercial activity, access credit, and increase their income. b) To establish an effective body that will help Small Groups make use of the business opportunities offered by the Clean Development Mechanism of the Kyoto Protocol on Climate Change. c) To reach every Parish with Health Education, especially on HIV / AIDS, and on Mother / Child Health. a) To build the much needed Diocesan Community and Training Center in Mpwapwa Town, which will also serve for the longer residential clergy courses. The Center is expected also to provide a more effective base for the Diocesan Operations. b) To service the Festina Loan for the Cathedral Roof and to undertake interior finishing works of All Saints Cathedral - the symbol of the Unity of the Diocese. c) To take the long-standing vision of re-establishing Kiboriani as a Retreat Center and Youth Camp by initially providing facilities for fifty participants. d) To provide reliable Transport for the Deans and Program Coordinators. a) The Cathedral, mostly built through voluntary labor, was roofed with help from a loan from USPG in 1997. We praise God for all his provision as this building has become more than just stone & mortar, but also an active place where people serve, go out to meet and share with others the Good News of the Gospel. The challenge of reinvesting into the Festina Loan fund remains, as does the need to complete the internal finishings. b) Work at Kiboriani Retreat and Youth Center is progressing very well. The site was cleared and the walls of the ruins that were covered under bushes and two-meter deep debris were exposed through a series of voluntary work camps. The site is already being used for retreats by various groups of Christians, including the Bishop and Senior Clergy, under temporary shelters. The construction of the first four Phase I Cottages has begun. c) St. Luke's Clinic has been established in a permanent home. Its facilities are already much used, and the Government District Medical Officer has assigned the Mother-Child Health care in Mpwapwa Town to St Luke’s Clinic. The Diocesan Medical Officer, together with a team of Health Workers, visits several villages for Community Health Education Programme. d) Transport in the form of 1 Land Rover and 6 Motor Cycles for the Christian Education Coordinator and the Area Deans respectively, to facilitate their work as enablers in the training and coordination of the clergy and catechists has been realized. Within the overall aims and aspirations of the Diocese of Mpwapwa to build a self-propagating, self-governing, self-supporting Church there are a number of areas that need specific attention and development, if we are to provide a solid base for future generations to grow holistically. A multi faceted approach is necessary placed at strategic centers to allow all in the Diocese and beyond to have equal access and to feel a part of the community of Christ as represented by the Anglican Communion. The specific needs are set out on page 10 with a brief description of their purpose and rationale highlighting the significance of each element. 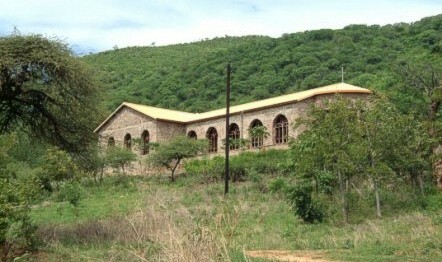 Taking the long-standing vision of re-establishing Kiboriani as a Retreat & Youth Center, Phase 1 would see the refurbishment of the old ‘Sanatorium’ as the focus of the site; and the construction of 4 accommodation cottages, Chapel floor, administration block, assembly and dining hall (as well as sorting out a permanent water supply) would complete the basic facilities. In the growing town of Mpwapwa, the work of the Church is greatly hampered by lack of facilities that can offer opportunities for the life of the Church and the community to be expressed in a variety of activities and concerns. The plans for the Diocesan Community and Training Center have therefore been drawn up to encompass the needs of longer residential clergy training, provisions for the community at large and facilities to enable the policy making concerns of the Diocese to be developed in an orderly manner. The Cathedral, set as it is on the site of the first inland Christian Church in East Africa, represents not only a witness to the historical foundation of Tanzania, but is also an ongoing See of Faith and corporate worship. The buildings enable the People of God to come together to study the Word of God, Pray and thus go back out into society taking with them the Good News of our Lord Jesus Christ. Whilst essentially the Church is the people themselves, in order to be effective in the charge given to us by our forebears proper facilities need to be provided. The interest free period of the Festina Loan kindly facilitated by USPG is coming to an end. The area in which the Diocese is situated has faced continued poor harvests for five years, curtailing any possibility of setting aside ‘surplus’ monies, for there have been none. As a result it has proved considerably difficult to raise funds locally from within the community in order to repay even the capital on the loan. The provision of the loan enabled the Cathedral congregation to move out of the dilapidated St. Luke’s Church at Ving’hawe in 1997 and for this we are tremendously grateful to our brothers and sisters in Christ who helped set up the Festina loan. None-the-less our responsibility to repay the loan remains. Roofing a building comes about half way through the construction process with the remaining 50% of works taken to complete the internal finishings and provide the basic installations such as electrics and an adequate sound system to address assembled congregations not only within the building itself, but also to the overspill gathered outside. Side chapels and vestries cannot be properly used for the day-to-day work of the Cathedral staff if windows are left open; or else papers and other documents are simply blown to the four winds of the compass! As a dedication to the Great Multitude of Saints spoken of in Revelations 7:9 a simple octagonal colored glass window will be installed to be known as the “All Saints Window” depicting the Lamb (representing Christ) at the center surrounded by the multitude of Saints worshipping, praying and reading, together with the symbol of the Compass Rose Society exhorting us to go to the four ends of the globe. For the larger services at Christmas, Easter and other ceremonial gatherings it would be more appropriate to relocate the focus of the community to an outside arena from which public addresses could be given to a wider audience. This would entail the proper landscaping of the external areas. In addition to the worship, administrative and public arena areas, the life of a Cathedral cannot be properly fulfilled without a community center providing both for the smaller social meeting and accommodation needs of official visitors. There is a vital need at the Provincial Theological College at St. Philip’s, Kongwa for the establishment of a Christian Leadership Institute. At present St. Philip’s is fully stretched particularly in terms of (already very basic) hostel facilities to meet the needs of a very comprehensive Certificate, Diploma and Degree Programme, limiting the development of a Christian Leadership Programme to that of a summer school centered around the college’s vacation times. If additional hostel accommodation and basic administration facilities could be built the program would be able to go ahead without such limitations. HIV / AIDS is a major problem in the area, with increasing numbers of HIV related deaths, and an incidence of HIV positivity among young adults of around 35%. The Medical Department is seeking to implement a programme of education around the Diocese, using peer group educators holding presentations with drama and music to communicate the message. It is also hoped to start a Voluntary Counseling and Testing service to serve the local community, with support groups for those who test positive. This is a new initiative in the Diocese of Mpwapwa encouraging creativity within Church communities helping Christians to explore and express their faith. Local people show great enthusiasm and ability in using music in worship and congregational life. The addition of both Biblically-based and social-issue drama to the creative repertoire has brought the Good News to life in a new and accessible way. Coordinated by David Walker, a mission partner of the United Society for the Propagation of the Gospel, the work began in 1997 with Christmas and Easter drama and music presentations in Churches around Mpwapwa. This individual initiative has slowly grown into a ministry of multiple teams of indigenous actor-leaders who now travel throughout the Diocese. David and Catechist Singoi Baharia, who plan the transfer to entirely indigenous leadership by October 2003, currently jointly organize the ministry. During the next two years, the ministry will focus on developing the leadership skills of the teams. To enable the seven hundred groups of the Mother’s Union and Youth throughout the Diocese a small enterprise loan facility is to be set up to allow each group to start an income generating scheme. Development always needs to be feasible if it is to be both achievable and maintainable. That said, whilst there is a vital need for it to be sustainable so that the revenue costings can be met out of day-to-day local income, the capital elements to put the infrastructure into place can be shared with a wider forum as these are essentially one-off costs that give a leg-up and act as catalyst to ensure that we can build a self-propagating, self-governing, and self-supporting Church. PO Box 2 Mpwapwa TANZANIA.